The Center on Disability at PHI has an experienced and technically strong staff. Individuals have skills and experience in project management, program development, research, program evaluation, the Americans with Disabilities Act, independent living, website development and maintenance, database development and maintenance, provision of technical assistance, dissemination and knowledge translation, technical video development, and quality control. , MPH, Executive Director of the Center on Disability, has been the Principal Investigator and Director of the Pacific ADA Center, since 1991. She is a nationally recognized expert in the Americans with Disabilities Act, has been the Director of Public Affairs for the President's Committee on Employment of People with Disabilities, has led research projects as well as service programs, and is on a number of national and international Boards concerned with issues related to individuals with disabilities. 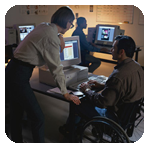 , MPH, MCP, is the Co-Director of the Center on Disability at PHI and the Pacific ADA Center. Mr. Kraus leads the national effort in dissemination about healthcare and the Americans with Disabilities Act (ADA) as well as inclusion of people with disabilities in emergency preparedness and management for the Pacific ADA Center - a topic on which he has co-authored research papers. He has also authored the 2015, 2016, and 2017 Annual Reoprts on Disability Statistics in the United States. He has also led the development of an Implementation Manual for Inclusion of people with disabilities in physical activity, nutrition, and obesity programs. Mr. Kraus' research projects have resulted in national reports and policy changes. His development projects have resulted in commercial products. Mr. Kraus was previously the Vice President of InfoUse.